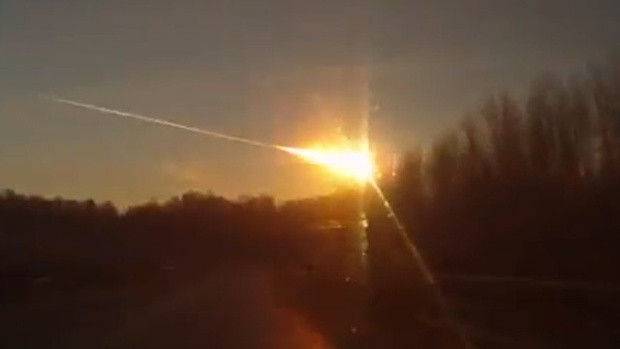 A meteorite traversed across the sky and exploded over central Russia near Chelyabinsk, Russia on Friday February 15, 2013 at 9:30 AM local time. It showered fireballs over a large expanse while causing aerial explosions that damaged buildings, shattered windows and injured 1,200 people. The Interior Ministry said that the meteorite explosions are a very rare spectacle, it also unleashed a sonic boom. The meteor was traveling at a speed of 30 km (19 miles) per second according to Russian space agency Roscosmos as it flared across the horizon, leaving in its wake a long white trail that could be seen as far as 200 km (125 miles) away. The early-morning blast and subsequent shock wave blew out windows on Chelyabinsk’s central Lenin Street, buckled some shop fronts and rattled apartment buildings in the city center. One piece of meteorite broke through the ice of the Cherbakul Lake near Chelyabinsk, leaving a hole several meters (yards) wide. According to Russia’s Academy of Sciences the falling celestial body weighed about 10 tonnes and may have been made of iron, entered Earth’s atmosphere and broke apart 30-50 km (19-31 miles) above ground. A wall and roof were badly damaged at the Chelyabinsk Zinc Plant but a spokeswoman said no environmental threat resulted. Russia’s Emergencies Ministry said deaths were reported but 20,000 rescue and clean-up workers were sent to the region after President Vladimir Putin told Emergencies Minister Vladimir Puchkov to ease the disruption and help the victims. The Emergencies Ministry described Friday’s event as a “meteorite shower in the form of fireballs” and said background radiation levels were normal. It urged residents not to panic. Simon Goodwin, an astrophysics expert from Britain’s University of Sheffield, said that roughly 1,000 to 10,000 tonnes of material rained down from space towards the earth every day, but most burned up in the atmosphere. The Interior Ministry said about 1,200 people had been injured, at least 200 of them children, and most from shards of glass. The regional governor in Chelyabinsk said the meteorite shower had caused more than $30 million in damage, and the Emergencies Ministry said 300 buildings had been affected. The energy released when it entered the Earth’s atmosphere was equivalent to a few kilo-tonnes, the power of a small atomic weapon exploding. The meteorite struck ironically just as asteroid 2012 DA14, a 46 m in diameter object was due to flyby closer to Earth than some of our orbiting satellites at a distance of 27,520 km (17,100 miles). This is nearer to our planet than any other known object of its size since scientists began routinely monitoring asteroids about 15 years ago. Scientists compared this recent meteor over Russia with an incident known as the Tunguska Event of 1908, when a meteorite was thought to have devastated an area of more than 2,000 sq km (1,250 miles) in Siberia breaking windows as far as 200 km (125 miles) from the point of impact.